Who was AP, the pre World War Two northern California photographer who created several series of Nevada post cards? The California Photographer who is listed twice in the 1940 U.S. Census in different cities. And who produced real photo postcards of Nevada. Who is A.P.? In the late 1930’s, a California photographer who used the initials AP to identify his work, produced a series of post cards of Nevada towns along U.S. highways 40 and 50. No name, just an A and a P attached to each other was the only clue as to who the photographer was. In the early 1900 during what would become known as the Golden Age of post cards, many professional photographers added post cards to their retail portfolio. Like most artists photographers putting their name of their art. Most used their full name or business, often on the back of the post card. In addition to determining where in Nevada the photograph for the post card was taken, it is also important to determine when, and who the photographer was and who published the post card. One of the photographers who only used a small logo that looked like a backward K attached to a P remained unidentified. Upon closer look at the few cards I had in my collection, as well as in dealer’s boxes, it was not a K, but rather an A. and a P.
Initially I assumed the “A.P.” stood for the news wire, Associated Press. I thought for a while the news wire association had licensed a post card company to use the A.P’s photographs to produce post cards. But most of the post cards I found the AP initials were not a period P. period, instead the A and P were attached. And there it stood; A few Carson City post cards, Lake Tahoe, and Winnemucca, but no idea who A. P. was. In a white rectangular box at the bottom of the photograph. Or, was I missing the obvious! Was Asher was just a sidebar business of FrAsher of Pomona? And, Asher’s first name was Fred as in Fr Asher? or Father Asher. No! deciding the 10th cup of coffee was pushing me into a galaxy far far away. A Google search quickly turned up “Asher’s Photo Studio” in Sacramento. A Sacramento photographer taking photographs of nearby Lake Tahoe? Sure, made sense, I had found the window into who Asher was, or so I thought. From Google to eBay finding cabinet cards for Asher’s Photo Studio, on J Street in Sacramento. While not Nevada, the price was right, and bought the photographs. 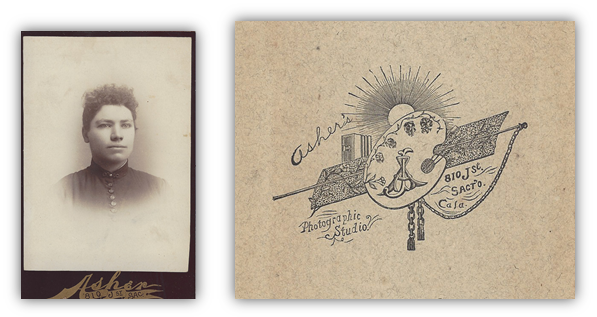 A week later, the two Asher cabinet cards arrived. Which lead to the question, how old Asher was when he produced post cards in the late-1930’s and early 1940’s. Time to find out a bit more of Asher from Sacramento. First stop, Carl Maurtz book, “Biographies of Western Photographers,” There on page 77 is a brief bio on Julius Asher who opened the “Opposition Gallery” on J Street in Sacramento by 1877. The bio listed Asher’s birth place and date as “Bavaria, 1847. Which means by the mid 1930’s the Sacramento photographer would have been in his late 80’s. Died in 1924! that takes Julius Asher out of the running for the photographer or publisher of the 1930’s real photo post cards of Nevada. Maybe a relative of Ashers? Put Asher Photo’s off to the side again and back to work on Albertype post cards of Nevada. Among the post cards, one from Reno stands out. A search of the Placerville newspaper, the between 1935 and 1940 turns up a W.G. Asher in the March 31, 1938 issue of the Mountain Democrat. And the article identifies Asher as a photographer. Good, right time period, right profession, and right last name, but in Coloma, not Placerville, close but no cigar – yet. The post cards feature a small photograph of the subject of the post card, and then eight to ten typewritten paragraphs about the image in the photograph. Similar layout to the Reno post card. Now, with a time period, the first initial, a middle initial, and a last name, along with a couple of towns within a few miles of each other time to check the U.S. Census for those two towns in 1930 and 1940. Nothing in the 1930 census. He told the census taker he was 59, married, and was born in England. One hundred and twenty five miles south of Butte, in Placerville a different census taker was at work. A William Asher told the Placerville census taker, on April 15, his occupation was that of a “photographer.” He told the census taker he was 59, married, and was born in England. So, either there were two 59-year-old William Ashers, who were born in England, married and were photographers or they are the same person. The Asher’s told the 1940 Placerville census taker they were living in Placerville since 1935. And at some point between 1935 and 1940 Asher lived and produced post cards in Coloma. Beyond the information contained in the 1940 census, and the post cards themselves, there is very little definitive information on William G. and Olive Asher, before or after that date. In the earliest photo there is an automobile parked in front of the building. In the later photograph, taken from a similar angle, there are three new signs. Two of the rectangular signs are government highway signs they are stacked on a single pole. The top sign directs drivers east on U.S. 40 to Elko and Salt Lake City and includes an U.S. 40 highway shield. The second traffic sign, directly below has an arrow pointing north to McDermitt, Nevada on State Route 8, with a Nevada highway shield on sign. The second separate sign, is a poster size sign is at ground level, with the words “Treasure Island” at the top. The bottom of the sign is not visible in the photograph, but likely promotes 1939 World’s Fair or as it was known, “The Golden Gate International Exposition. The event was held at Treasure Island, which is located in the San Francisco bay. The exposition opened first for eight months starting in February 1939. And, then re-opened in May of 1940 for another four months. While we now have the name there are still many unanswered questions about the Ashers. Why did he get in and out of the post card business?. One answer may be competition. At the time the Frasher post card company of Pomona, California was marketing post cards in every nook and cranny of Nevada. And quite frankly in most cases the Frasher post cards were of better quality, both visually and from a production standpoint. But, William Asher’s post cards of Nevada provides important views of life in Nevada in the two or three year period before World War Two. A list of known Asher Post Cards of Nevada and other details of his work. “Asher’ Photo” is found on Ashers post cards with long printed captions. Asher’s post card focus in Nevada was south of Reno, coming into Nevada through U.S. 50 and then up to U.S. 40 and east to Elko and then south to Ely on U.S. 93. More than two dozen post cards of Carson City have been identified while only a few of Reno. And while, Asher produced a number of post cards of coming into Lake Tahoe, on the California side coming into Nevada along U.S. 50. On the Nevada side, at this point, it appears Asher’s focus was that of “Cave Rock” a popular site for both professional and amateur photographers. Common Themes and other notes. Asher had a pattern to his post card images. The following titles “Entering” insert community, “Business section” are found for many of the communities he visited. “Entering…” There are known “Entering” post cards for several Nevada cities including Elko, Lovelock, and Winnemucca. “Business section of…” , There are known “Business sections” postcards for several Nevada cities.Carson City, Ely, Reno, Sparks, and Winnemucca. Asher made it a point to take photographs and produce post cards of Civilian Conservation Corp camps in Nevada. To date, two have been uncovered. Based only on the number of post cards Asher produced for Captain Acree’s Auto Court in Winnemucca, it is likely the photograph also stayed at the facility which featured an cabins, coffee shop, and Texaco service station. Asher post cards are found with and without the AP logo. In addition to numbered and unnumbered post cards, Asher also produced a series of post cards with a number and a letter. It is possible the “d” is for desert and the “L” is for Lake Tahoe, and the “N” is for generic Nevada scenes. And a letter of the alphabet and then the number, N3. It is clear, Asher came into Nevada on U.S. 50, took photographs and sold post cards of Carson City, moved east to Fallon. Leaving Fallon Asher headed north to Fernley and then east on U.S. 40. At this point not post cards from Asher have been uncovered of Fernley. However not Far East of Fernley on U.S. 40 was, at the time, Springer’s Hot Springs. Ike Springer offered hot mineral baths, dancing and cold drinks. Asher sold him several post card. Continuing east on U.S. 40, Asher stopped and took photographs and published post cards of Winnemucca, Battle Mountain and Elko. Asher also took scenes along highway 40 as he was traveling from one community to the next. From Elko, Asher headed south on U.S. 93 to Ely and McGill. It does not appear that Asher went further south on U.S. 93 or headed back home west on U.S. 50. No Asher post cards have been found from either Austin, or Eureka or any location on U.S. 50 west of between Ely and Fallon. There is at least one Asher post card along U.S. 50, but that is north of Ely when the highway shares highway with U.S. 93. Asher’s credit line or logo are found on post cards with views of two U.S. highways in Nevada and at least sixteen Nevada communities. To date no Asher post cards have been uncovered from the following communities along U.S. 40; Fernley, Carlin, or Wells. Asher worked out a business arrangement with the Museum of Memories in Virginia City. He produced a series of numbered and unnumbered post cards for the tourist attraction. The highest known number on a Museum of Memories Asher post cards is 36. Asher also put a copyright (C) and his name “Ashers’ Photos” on some of the post cards for the Museum of Memories. How many Post Cards did Asher produce with Nevada images? Based on the numbered post cards and assuming the unnumbered post cards were first released with numbers, it is estimated Asher produced between two-hundred-and-fifty, and 300 different post cards of Nevada. There is still something mysterious about the Ashers. He popped up and left the business right before World War Two. When the Ashers arrived in the United States is not clear, nor when and where they passed away. What we do know, Asher was producing real photo post cards of California and Nevada in Coloma in 1938 and continued after he moved to Placerville. Based on the images and post marks Asher appeared to produce most of his Nevada views between 1938 and 1941. It does not appear that Asher returned to the post card business after World War Two. That is currently where the Asher story ends. Asher released both numbered and unnumbered post cards with images of Carson City. Starting at number one, the highest known number in the series is 24. 25 Missing or was 24 the last in the Carson City series? Carson City, July 24, 1941. Card number 5. Carson City, September 18, 1941, Card number 1. “Carson City, Nevada.” This is a photograph of the Carson Brewing Company. “Fire House Carson City Nev.” No Asher credit line or logo. Asher produced an unnumbered series and two numbered series featuring views of Elko. 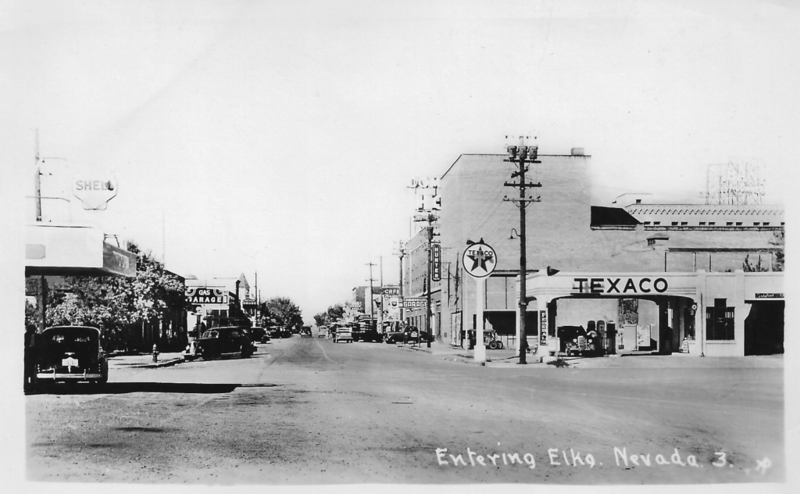 With a starting point of one, the highest known number in the numbered series of Elko post cards is 42. The earliest known post mark is Elko, June 4, 1941. In the second number series Asher produced for Elko he added the letter “N” in front of the number. The earliest known post mark in the Ely numbered series is Ruth, October 2, 1939. The latest known post mark in the Ely series is Ely, February 25, 1945. Asher produced a numbered series of post cards of White Pine County, Nevada. This series also includes images of Ely, McGill and Ruth, Nevada. The earliest known post mark in this series is Ruth, October 2, 1939. Starting with one, the highest known number of Ely post cards produced by Asher is 23. Asher produced a series of numbered and unnumbered post cards of Fallon. All of the Asher post cards of Fallon in the collection are unused. The highest known number, starting at one, in the Asher post cards of Fallon is 21. There is a known post card with a view of a government camp at Golconda. Based on the title and the series number it is included in the Winnemucca list. The title is , “A Section of C.C. Camp Golconda, near Winnemucca, Nevada. 31” with the Asher logo. The Winnemucca Asher list includes post cards 30 and 32. At this point, this is the only known Asher real photo post card with a view of Golconda. Golconda is located 17 miles east of Winnemucca. Most of the Asher post cards of Lake Tahoe are of the California side of the lake. There are three different credit lines on the California Lake Tahoe post cards including the standard AP back to back version, an AP where the letters are separated by periods, “A. P.” and an “Ashers Photo” with and without the possessive mark on the s in Ashers’. “Cave Rock Tunnel. Lake Tahoe.” (AP) The view is looking through the tunnel from the north end. With ‘ghost’ image of card at south end of tunnel. “Cave Rock Tunnel Lake Tahoe, Nevada. ” (AP) The view is looking south thought the tunnel. “Cave Rock Glenbrook, Nevada.” No Asher credit line or logo. “Lake Tahoe through Cave Rock L69.” No Asher credit line or logo. Asher released both numbered and unnumbered post cards with images of Lovelock. Starting at one, the highest known number in the series is thirty. Asher appears to have produced a limited number of post cards of Reno. No numbered series has been uncovered. Two cards in the collection Reno file appear to have been part of a sales man’s sample album. Both have similar glue marks on the back, and both have hand written numbers on the lower right corner of the white border on the face of the post cards. It is also possible a collector glued the post cards in an album and wrote the numbers on the post cards. It either case, with the known hand written numbers of 7 and 13, it is likely Asher produced at least 15 and 20 views of Reno. “High School. Reno, Nevada.” 13. “High School, Sparks, Nevada.” with logo. The photograph for this post card was taken from a different angle, than the other post card titled “High School,” but shows the same automobiles. “Robert Mitchell School. Sparks, Nevada.” with logo. “Junior High School. Sparks, Nevada.” with logo. “The Library, Sparks, Nevada.” This image was also released with the number 17. “S.P. Roundhouse, Sparks, Nevada.” Likely this post card is from salesman book. Handwritten number 19 on face. “The Library, Sparks, Nevada. 17.” This Sparks Library post card was also released without a number. Springer’s or Brady’s Hot Springs is located east of Fernley. Asher likely produced at least four post cards from this site. Two individual post cards, without any Asher credit line or logo, but are clearly Asher productions feature images of Springer’s Hot Springs. One post card, titled ‘SPRINGER’S HOT SPRINGS,” has three images, all with individual titles. “The Plunge at Springer’s Hot Springs, Nevada” with an Asher logo. Asher created a series of unnumbered and unnumbered post cards for the “Museum of Memories” in Virginia City. It is assumed this post card was part of a Virginia City series. “King of the Air. Pub. by Museum of Memories Virginia City Nevada. Ashers’ Photos. The Asher post card series of Winnemucca is a numbered series. There are at least thirty-seven cards in the Winnemucca series. Interesting elements to the Winnemucca post cards produced by Asher. Asher used the same image for the post cards he titled “Winnemucca from the Hills. The same image is titled 3 and 8. In the later photograph there is are two new signs readable as drivers were heading east on U.S. 40. “The Prospector & his Pardner.” Show ‘prospector’ sitting on rock with coffee pot in front and his burrow. Post card is listed here only because of WInnemucca post mark Nov. 22, 1938. There is no AP credit mark, however the same font on this post card is used on other Asher post cards. The earliest known post mark is January 3, 1940, Railroad postmark, Ogden & S. F.
“CAPT. ACREE’S AUTO COURT” A vertically printed postcard featuring three views of “CAPT. ACREE’S AUTO COURT” Two of the three views were also produced as stand alone post cards. The third image was taken the same day as another post card that was also produced as a stand alone post card. “A row of Cabins at Capt. Acree’s Auto Court. Winnemucca, Nevada.” No logo. This view is one of three featured on the vertical post card. “A shady Grove of Capt. Acree’s Auto Court, Winnemucca, Nevada.” No logo. This view is one of three featured on the vertical post card. “Winnemucca from the Hills. 3.” Note, same image as 8. “Winnemucca, Nevada. 14.” This is a photograph of the Humboldt Hotel. Note, this title is on a black horizontal bar that may have covered up a different title. Currently, it is the only known Asher title on a black bar. No Asher credit line or logo. This is the same photograph that was used for the Asher post card titled “St. Mary’s- Roman Catholic Church. Winnemucca, 32” This post card has the Asher logo. “Approaching Winnemucca, Nevada. 21” ap note this image shows Captain Acree’s service station, cabins and coffee shop. “Winnemucca, Nevada – from Winnemucca Mountain. 24.” Note, no Asher credit line or logo. “High School. Winnemucca, Nevada. 27” Note, different view of school. “Looking Towards The Hills, Winnemucca, Nev.” 32 note same number as above. Note, see post card 19. “Fire House Winnemucca Nev No. 35” Note, vertical post card. “Scrub Cedars, Sage & Mountain Peaks 26 Highway 40, Nevada.” No D.
“Sagebrush and Desert Hills on Highway 40. Nevada.” No. D or number. “Morning on the Desert. 1D” upper case D.
Old Home of Lola Montez. Grass Valley, Calif. 13. “A Glimpse of Nevada County Court House from the Hills. Nevada City, Calif 11 AP” A couple of notes, spelling error on Glimpse, and wonder if there are ten or more cards of Nevada City in this series. [i] California Department of Health and Welfare. California Vital Records-Vitalsearch (www.vitalsearch-worldwide.com). The Vitalsearch Company Worldwide, Inc., Pleasanton, California. [ii] “Lotus,” March 31, 1938, Placerville, California, Mountain Democrat newspaper, page nine. [iii] “Lotus,” March 31, 1938, Placerville California, Mountain Democrat newspaper, page nine. [iv] “Salmon Falls News,” November 15, 1945, Placerville, California, Mountain Democrat, newspaper, page fifteen. a dearth of information on the subject. Would love to see more. Phil, thank you for your comments. Continue to update as new information about Asher become available. While my focus, like yours is Nevada, Asher’s work was mainly northern California. Hoping a California collector will read and fill in the many gaps in the story. Is your focus Las Vegas or Nevada in general? Previous Previous post: Chapter Two. Northern Hotel and Bar. Raids, Illegal gambling and alcohol.